As a kid, I loved to hang out in the shape that I know today as shoulderstand. I enjoyed just lying on my back, kicking my legs up, and grabbing my low back with my hands so I could enjoy the hovering sensation of my feet and legs above me. It felt like I was floating in outer space! Today, as someone who teaches yoga, I rarely teach salamba sarvangasana (shoulderstand) unless I have a class full of seasoned practitioners. That’s because it’s an advanced pose (it’s called the queen of poses for a reason) that requires proper propping for optimal alignment and injury prevention. And even for advanced yoga practitioners, it’s still not a pose that everyone feels comfortable with. Even though I only teach shoulderstand to experienced yogis, I often see students I know to be new to asana do shoulderstand on their own—and they get into the pose similarly to how I did as a child: literally by lying on their backs, kicking their legs upward, and pressing some area of the low back with their palms for that extra lift. Yikes! This haphazard way of throwing the body into shoulderstand often leads to unsafe alignment, muscle strain if you haven’t warmed up, and possibly an attention-grabbing topple to the floor. Most importantly, repeatedly coming into shoulderstand without careful attention to alignment (and sometimes even with careful attention to alignment) can seriously injure the cervical spine. Still, it's understandable that even brand new yoga students would want to try shoulderstand. Going upside down can be a lot of fun (that's why so many of us naturally found our way into this pose as kids, right?). And even though many teachers would argue that shoulderstand is a riskier pose than inversions like handstand, forearmstand, and even headstand, for a lot of people, it feels more accessible. 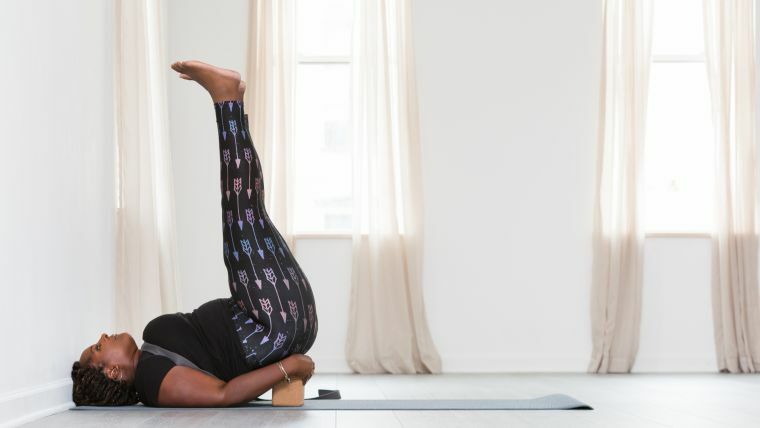 While a new student (or for that matter, even an experienced student) may not be able to stand on her head or support himself upside down in an arm balance, getting upside down by rolling back into a shoulderstand often looks and feels more doable. So what are some safer options that teachers can offer and students can practice in order to experience the joy of inverting without putting their necks in such a risky position? If you’re new to shoulderstand and know that you have tight neck and shoulder muscles (super common in our age of tech and forward-leaning head postures! ), or want to avoid the risks of full, unsupported shoulderstand, you can still feel as regal as a queen in your yoga practice. Here are two alternatives in which you can enjoy the lovely benefits shoulderstand offers, such as increasing circulation, soothing your nervous system, and stretching and strengthening the upper body, without as much risk. Helpful props: blocks, a wall, blankets or towels. 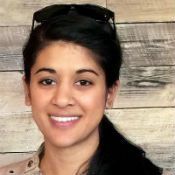 Set up near a wall: Place one end of your mat near the wall; at the other end of your mat, place a small stack of blankets or towels (folded tightly so that they are firm) with the folded edges, which will be thicker, facing the top of your mat. Lie down with your upper back (not your neck) supported by the blankets and your head on the floor behind them; your shoulders should be positioned just slightly in front of the top edge of the blankets since they are likely to shift back as you come into the pose and you don’t want your shoulders to slide off the blankets. Because your head and neck are not on the blankets, there is a space between your neck and the floor, allowing the curve of the cervical spine to be maintained. Bend your knees so that the soles of your feet press into the wall and your knees are stacked above your hips. Lift your pelvis as you continue to press through your feet, bringing the backs of your thighs parallel with the wall. Your weight is supported by your upper back here—not over your shoulders, like full shoulderstand, and definitely not over your neck! Draw your shoulder blades toward each other, and broaden and lift your chest, maintaining the space between the back of your neck and the floor. Draw your elbows parallel to one another and bend them to place your palms against the back of your pelvis for support. If you feel stable and comfortable, you may experiment with extending one leg, or perhaps both legs, away from the wall. To come out, first bring your feet back to the wall, release your hands from your back to the blankets/towels, and then slowly lower your hips to the mat. Tip: Larger-chested people can use a strap to create space and make shoulderstand more comfortable. Loop your strap around the top of your chest, and cinch it just under your armpits to create a firm, fitted support. When you come into shoulderstand, the strap may help to keep your chest away from your face, making it easier to breathe in the pose. Feel free to use the option of placing folded blankets/towels under your back (as described above) in this variation too. Though raising the upper back isn’t as necessary to maintain the curve of the neck since you’ll have the support of the block under your hips and thus won’t be coming up as high (which tends to cause the neck to flatten), be mindful that you do still maintain space between the back of your neck and the floor if you choose to omit the blankets/towels in this variation. Bend your knees to bring your feet flat on the floor, hip-width apart. Ensure that your feet, shins, and knees are parallel to one another, as if you were preparing for bridge pose, with your arms by your sides. Lift your hips and place a block on its widest side under your sacrum—the flat, triangular, bony area at the point where your low back and pelvis meet. You should feel supported and stable on your block when you have the block in the proper spot! Move your arms to a T and take a few breaths here, allowing your chest to expand. Then, bring your arms back alongside your ribs, and broaden your chest, allowing your shoulder heads to settle back into their sockets. Draw your knees into your chest, and then start to extend and straighten your legs upward. You may need to pause and return your feet to the floor momentarily to adjust the block for stability (or bring it to a higher level for a more challenging variation). Once your legs are fully extended, flex your feet to help keep them engaged. 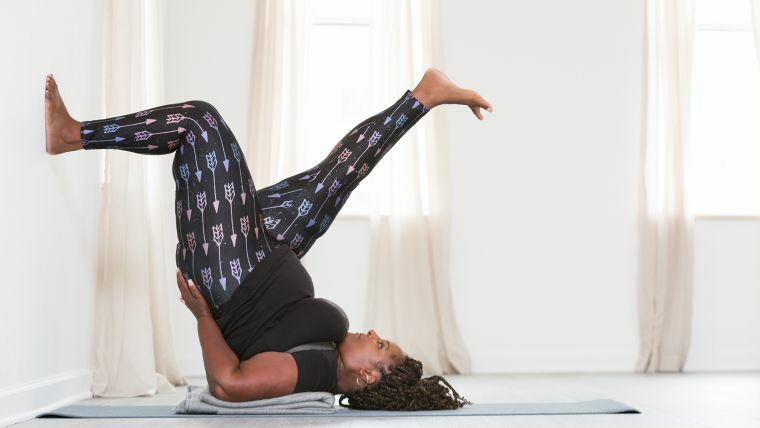 To release the pose, lower your feet to the floor one at a time, lift your hips to move the block out from under you, and then gently bring your back and hips down to the mat. Finally, simply taking legs up the wall (or up the back of your sofa!) in place of shoulderstand can be a luxurious, restorative alternative. 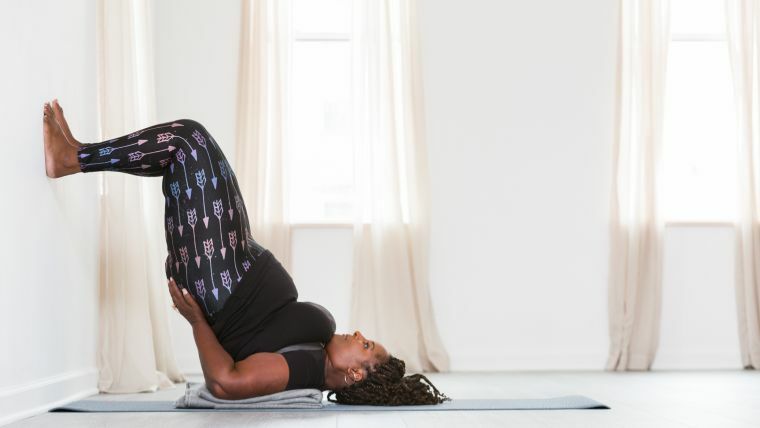 This gentle alternative can provide many of the benefits of shoulderstand and shoulderstand variations, such as a pacified nervous system and relief for tired feet and legs. What are you waiting for? Go get that (safe and aligned) “floating in outer space” feeling!